We here in the UK are being blessed with a week of dry weather with largely clear skies and much (daytime) sunshine. Therefore I thought that it could be worthwhile to stay up well into the night in an attempt to see this special event. Having done so I am delighted that I did - finally getting to bed at 4.30am was a small price to pay for something that will not be possible again until 2033! I don't have a telescope and instead used an ordinary pocket sized compact camera which has manual exposure controls for shutter speed & aperture - but not for manual focus. Possibly it was too dark for the auto-focus to work properly so I apologise for a lack of sharpness in my images. All images have been cropped and gently manipulated in photoshop to make them a little brighter. This first image was taken shortly before the blood colour effect kicked-in. 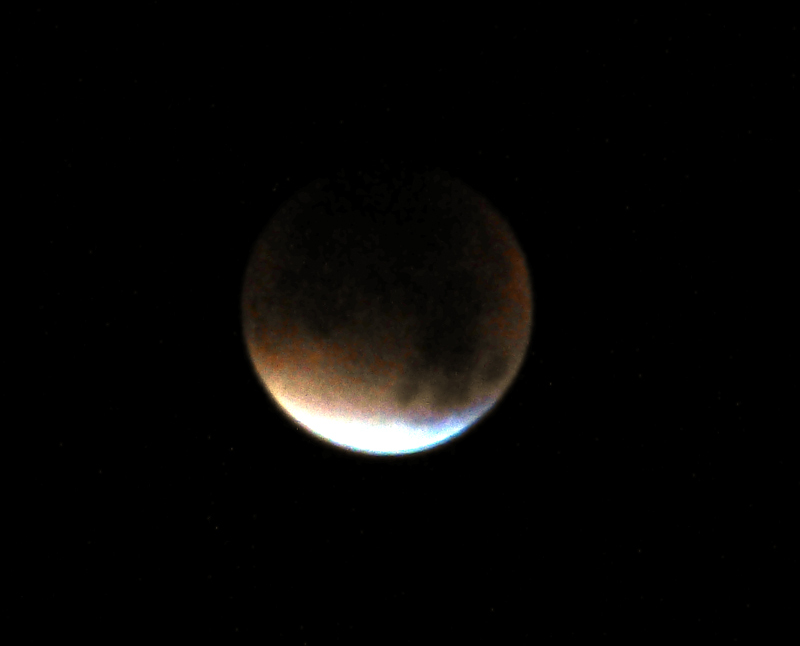 Here is a close-up, taken with the camera set at 3200 ASA and using a mini-tripod on the roof of the car. Whilst image quality is affected by the very fast ASA rating the exposure still took over a second and I was concerned that if it were much longer than this the movement of the moon around the Earth might make it blurry. Here is a wide - angle view showing the scene as seen when looking up with the naked eye. The yellow-wish colour cast is from the street lights. I find this image to be somewhat surreal. I think that most people are used to looking up at the moon and seeing a glowing white orb hanging in the sky; so to see a dull reddish orb is bizarre / unsettling. It is easy to understand how in older times people would see this as an omen of some sort. Before the eclipse occurred I did very much want the moon to be high in the sky, and this is exactly what I got! In the process I saw a much more normal* type of full-moon scene which is very different to the type of image normally shown in professional photography where a very large looking moon is nearer the horizon and also close to buildings. *Normal compared with moon rise and moon set, when the moon is low on the horizon - this being something that is seen much less frequently than when the moon is high in the sky. I feel 'something' undefined. It is as if an energy has reached through and touched me at the core of my being. I am still processing this, and cannot be sure if its cause lay in the eclipse, the ongoing Wave X energy, them both and / or something else. Edited by simple simon, 28 September 2015 - 08:40 PM. ...What a Heart Rendering-dedication-curiosity, and photography. How'd you stay SOBER? Yeah, I too was up at those hours-but didn't really get 'Heated' or WOW about it. This is FRENZY, the kind MSM and border line Retard Pundits get all excited about and hook people into. Sort of a 'contact High' and 'we're all in this together' Bull Shite...which I REALLY try to avoid as much as possible. 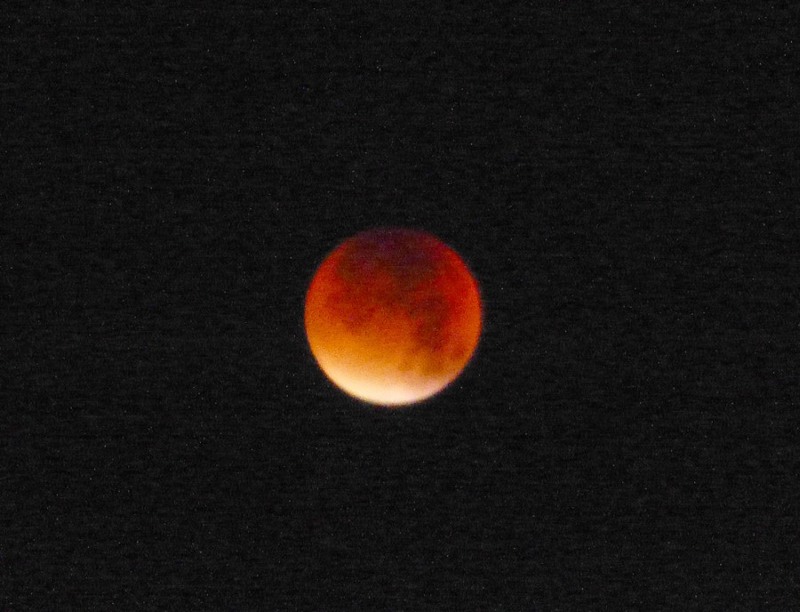 Having said that, I do commend Simon for his 'on the spot' coverage of Blood Moon/Eclipse FEVER. Sure he had his reasons to follow 'Mass Hive Insanity'. LAUGH. But Thank you-from the 'Bottomless Pit OF doing what people are programmed to do'. Don't think anyone 'ASCENDED' or 'took off' to higher Levels of existence, greater expansion of Consciousness, nor Enlightenment with this 'Heavenly' event...though some might have thought, delusionally, that they did. Of course if 'YOU where ON Something' the whole experience may have taken on a WOW Factor...if it wasn't a 'Bad Trip' that is. Well, that's my tonight 'tongue in cheek' wrap up of feelings about all this RAVE. Think I'll sleep better/earlier tonight...having at least felt the accomplishment of 'Staying Awake' throughout this HYPED Extravaganza. LOL, well curiosity killed the cat, as the saying goes. Its very much a case of us having the right weather at the right time and me 'doing' because I could. Oh and an afternoon nap on the Sunday plus an early night on Tuesday! 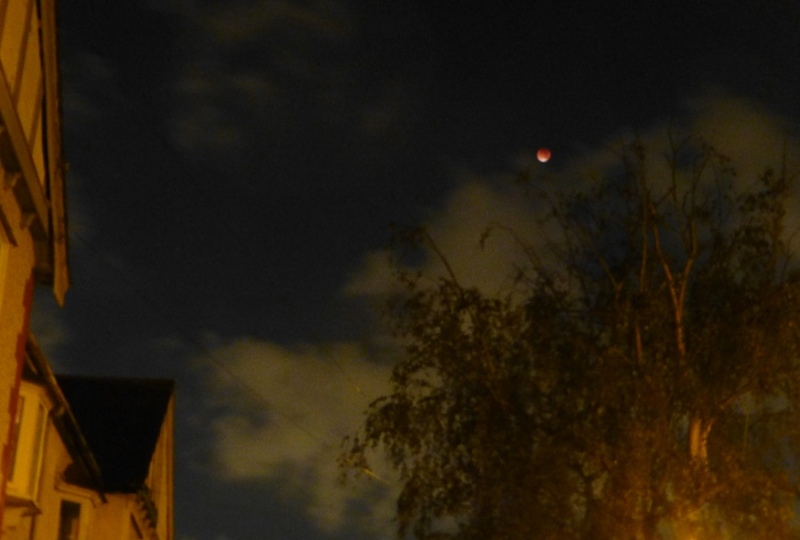 That last photo of mine shows the red moon from an angle which I've never known the media to publish. The fact is that 99% of the time people see the moon its high in the sky and quite small, yet all we get from the media are special images showing it close to the horizon. Why did I do this? Many reasons, including the comment by French Foreign Minister Laurent Fabius about there being "500 days to avoid climate chaos". I saw the eclipse as being more of a marker for a season of change than of a specific day when things will change. Edited by simple simon, 30 September 2015 - 03:48 PM. ....Just look at this-from INTEL Sources-of a blue moon doppelganger beside the shining white full moon taken on the night of the blood moon before the blood moon appeared ie. 11-57pm CEST (9-57pm GMT) 27th Sept 2015 in Lubbock, Germany where the blood moon appeared in the early hours of 28th Sept reaching its max eclipse at 4-47am CEST (2-47am GMT) in Lubbock, Germany. So, folks, as prophesied in 1871 the 2nd moon has now appeared, AND 'WE' will show you both the photo and the VIDEO-of how this was discovered. PHOTO 1st OF A NEW BLUISH MOON RIGHT NEAR OUR FAMILIAR MOON-WHAT'S THAT MEAN HUH? **NOW CLICK ON THE VIDEO-GUY WHO TOOK PHOTO/DISCOVING 'A NEW MOON FORMING'? I've never seen or heard about such a possibility before. Is he sure its not related to ghosting in the camera lens glass? ...No, nor I Simon-be VERY interesting to see what you can 'dig up' about the 1871 Prediction on this. Talking about 'MOONS'-NASA just released photos/Animations of PLUTO'S Biggest MOON-CHARON. Imagine DWARF Planets with MOONS. Lots of NEW things being divulged now huh? Wonder why all this INFO is now being SHOWN. What's the Agenda? However rather than validate this information they suggest that its a hoax. So, if this has come from intel sources then they must have access to data that remains unknown elsewhere. As for the YouTube, as I said before, maybe the very bright moon was reflecting inside the cameras' optics? Since nothing of benefit has been found online so could the intel folks please release more information - preferably of the sort which would be accepted on the 6pm TV news and newspaper front pages. It would be nice to have something truly significant to drown out all the personality glitteratti and war talk. ...OK Simon. 1st A BIG thanks for 'looking up' & searching 4 references to this Issue-of a 2nd MOON. You don't really want something suitable for 6 O'clock MSM News-do you now? Astronomers across the world were alerted to this sighting and have confirmed the existence of a second earth moon. 'We have never seen anything like this before', said researcher Rich Montano at the University of California, Los Angeles. 'There had been some rumors that a second moon was seen over Hong Son, Thailand in 1967, but it was only seen for a few hours and only in that one location, but now everyone across Australia can see the second moon. It’s awe-inspiring'. NASA astronomers are studying the second moon carefully.The powerful Japanese telescope, the Subaru, is also focused on the second moon. When asked to explain this phenomenon the head of NASA’s Lunar Science Division had this simple statement, 'We don’t know. We are studying it, but it has us all baffled'. LOL re: MSM... you're right, I want something thats truthful - not the usual lamestream media BS! This other space body could be something that is etheric, or that has not been visible (to us) in the past aeons. It could even be artificial / cloaked and not intended for us to perceive. Cameras are supposed to be better at 'seeing' into other realms than our eyes. I wonder if its inhabited - and if so, by whom? Anyway, I look forward to learning more about it. PS: to get the film to show up in a playable format I dropped the s from the https:// part of the url. Edited by simple simon, 03 October 2015 - 11:50 PM. Its connected with the Sphere (or Blue) Avians which Corey Goode, Dr Salla and David Wilcock talk about. After all, it is blue in colour! In some of the "Message From An Alien From Andromeda" YouTube messages there has been talk of another planet joining this solar system. Could this be it? Ideas, ideas and ideas. Could be 1 million miles off, could be near to the mark, could be accurate. I dunno which.